Vertex 360 Loop Wing for Doubles. 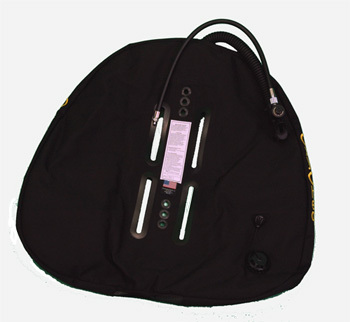 Inner Bladder/Single Inflator Wing in 360 degree design. Very streamlined providing for less drag and less energy expended when swimming. This 360 design allows for better trim and buoyancy characteristics than the older horseshoe designs. Inner bladder is thicker providing for better puncture resistance. The 42 pound wing works great for small doubles and for smaller rebreathers like the KISS and Draeger. The OxyCheq wings have the lowest profile. This means less drag in the water and more distance traveled with less energy expended. I bought this wing for use with an Inspiration CCR and it's brilliant. Does the job very well and provides lift were it's needed, at the bottom, to get you out of the water on the surface.